Original Story: If you're a US Cellular customer toting around a Galaxy SIII, you can expect to get your hands on Samsung's TouchWiz-coated Jelly Bean update for the device starting this Friday, December 21. New live camera and camcorder filters offer a range of new ways to spark your creativity. Warm vintage, cold vintage, black and white, sepia, color highlights(blue, green, red/yellow), and many more are selectable from the main camera screen. Easy Mode:Easy Mode is a simplified user experience option for first-time smartphone owners, providing large home screen widgets that focus on the device essentials. The Easy widgets include both 4x2 and 4x4 arrangements of favorite contacts, favorite apps, favorite settings, clock and alarm. Blocking Mode:Galaxy S III owners can disable incoming calls, notifications, alarms and LED indicators for a designated period of time. Instructions for updating your Galaxy SIII – either via KIES or over the air – will be available at US Cellular's own update page (linked below) starting Friday. For more information on the update, head to Samsung's standard Galaxy SIII Jelly Bean press release below. 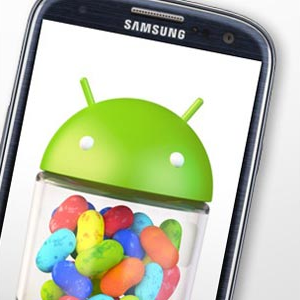 Otherwise, sit tight – the wait for Jelly Bean is almost over.